GARDEN STATE EQUALITY, New Jersey’s largest LGBT rights organization, would love to partner with local business owners for their upcoming Equality Walk! Now in its 9th year, Equality Walk is one of their most popular events, drawing hundreds of participants annually. This year, to underscore their commitment to all of New Jersey, they will be holding a total of three walks, representing the three geographical regions of our great state: north (Montclair), central (Asbury Park), and south (Atlantic City). 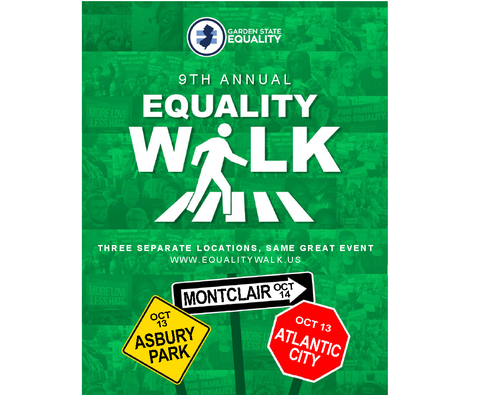 Equality Walk Weekend will take place on Saturday, October 13th - Sunday, October 14th. Saturday, October 13th - Sunday, October 14th.